HIGH Landing a perfect spin dash on a boss. LOW Cutscenes of this length feel out of place in a game like this. Retro-style games have a harder task in front of them than one might think. Besides capturing the look and tone from a specific bygone era, they also have to mimic retro mechanics as well, and those mechanics are often out-of-date and difficult to return to in today’s modern age. It’s a delicate balancing act to emulate something ancient while functioning as something more advanced, and very few titles can pull it off successfully, a la Shovel Knight. Freedom Planet, a 2D platformer in the mold of early 1990s Sega Genesis titles, is another rare one that gets this balance right. While it may not appear all that special on the surface, after only a few minutes of playtime I could see that developer GalaxyTrail had both great affection for and knowledge of their subject material. As a result, Freedom Planet is one of the best platformers I’ve ever laid hands on. Taking on the role of one of three anthropomorphic animals, Lilac, Carol, and Milla, the player must defeat an alien warlord intent on stealing their planet’s energy source. While the characters are well-drawn, well-voiced and likable, the story is primarily told through very long cutscenes between stages. This type of storytelling, while not terrible on its own, is pretty bizarre when sandwiched between fast-paced platforming and action-heavy gameplay. Fortunately there’s an option to skip every cutscene, and even an entire game mode that removes most of them altogether. Strange cutscenes aside, Freedom Planet demonstrates a robust understanding of what made its source material tick. In contrast to Nintendo platformers of the same time period, the Genesis flavor placed more emphasis on not just speed, but freedom of movement, faster-paced action, and more complex enemies. The marketing slogan “Genesis does what Nintendon’t” was actually pretty apt when it came to platformers. While Sonic the Hedgehog is the most well known staple, the likes of Rocket Knight Adventures (for its mobility options) and Gunstar Heroes (for enemy and boss design) were noteworthy as well. 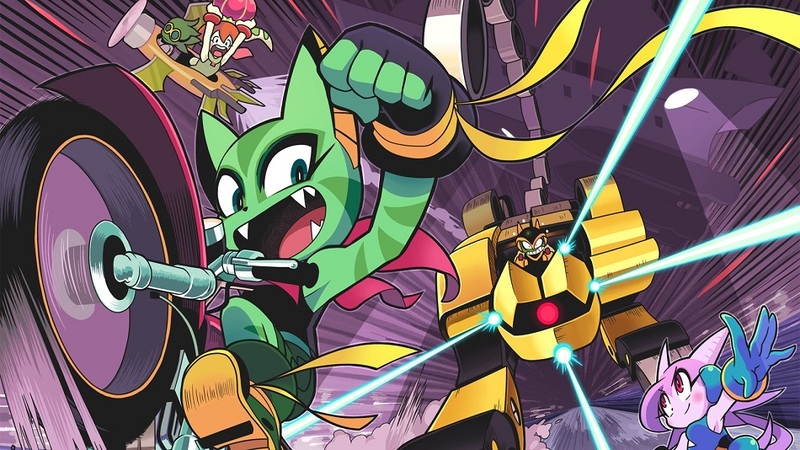 Freedom Planet manages the impressive feat of meshing the best parts of all three while still presenting an experience all its own. I spent most of my time playing as Lilac, the ostensible main character. Of the three options, she offers the closest thing to a classic platformer playstyle with a basic double jump and melee attacks. However, Lilac’s signature move is a multi-directional spin dash attack used for both mobility and combat, similar to Sparkster’s rocket dash in Rocket Knight Adventures. This one move is the heart of what makes Lilac and Freedom Planet work so well. A well timed spin dash can send Lilac roaring through a level at breakneck speed, or it can erase bosses in a matter of seconds. While controlling her is a breeze initially, the timing and positioning required to execute the perfect dash takes time to learn. Thus, Freedom Planet hits the sweet spot of being both approachable for casual players and rewarding for those who put the time in to learn all the tricks. While Carol (short-range combat focused) and Milla (defensive/ranged attack based) have their own enjoyable quirks, neither felt as well-executed as Lilac. Having the option to replay the game and get a new experience is nice, but frankly they could both be removed completely and the game wouldn’t suffer for it, whatsoever. Level design is by far the most Sonic-esque thing about Freedom Planet, which is what allows Lilac’s movement options to shine. Each area is a beautiful, expansive piece of scenery filled with all manner of obstacles tailored exquisitely to her abilities. There are also a staggering number of enemies unique to each level, with appropriately grandiose bosses. Difficulty scaling is also handled extremely well, with the challenge slowly ramping up from a smooth romp in the first level to a frantic nail-biter near the end. While all this talk about level design and movement abilities certainly sounds every other platformer in existence, what makes Freedom Planet stand out is how well all of these elements work together. Games like this often have problems with competing systems that pull the player out of the game’s flow. Things like forced combat sections or a sudden spike trap out of nowhere can destroy a stretch of traversal. Every action taken by Lilac, every enemy, and every obstacle feels like part of one smooth sequence that links together. 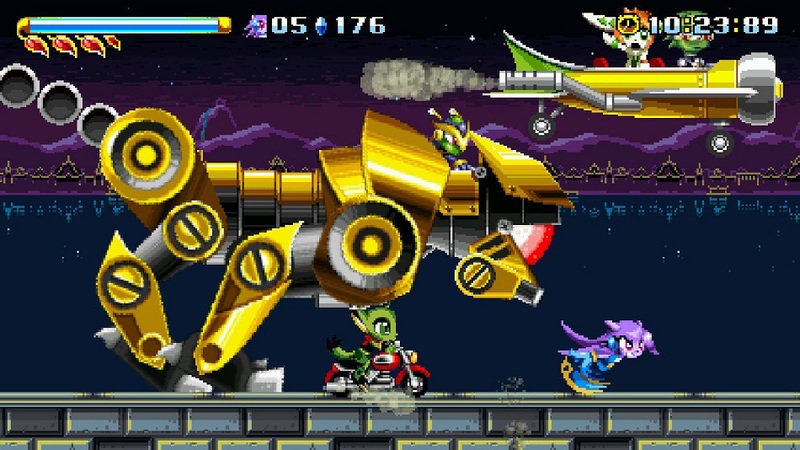 Far beyond simply working well holistically, the pieces of Freedom Planet hum like a fine-tuned engine in a way that not even its predecessors could quite match. Disclosures: This game is developed and published by GalaxyTrail. It is currently available on PC, PS4, and Wii U. This copy of the game was obtained via paid download and reviewed on the PC. Approximately 7 hours of play were devoted to the single-player mode, and the game was completed. There are no multiplayer modes. Parents: According to the ESRB, this game is rated E 10+ and contains Fantasy Violence. The story is quite a bit darker than one would expect, especially a certain violent event that occurs early on. However, it isn’t enough for me to bump the rating up, so 10 and up seems appropriate. Deaf and Hard of Hearing Gamers: Audio is generally not a factor in gameplay and all dialogue is subtitled. However, the final boss has a few audio cues with no matching visual cue, so Deaf players may find the battle harder without them.